The barrio of Maria Auxiliadora slopes up one of the many hills in the dusty mountain bowl surrounding Cochabamba, Bolivia. Visually, there is little to distinguish it from the other barrios of the city’s working-class southern periphery: it’s a melting pot of one-room brick houses and building sites. Despite its innocuous appearance, a remarkable history sets this neighbourhood apart: since 1999, Maria Auxiliadora has worked to create a safe environment free from domestic violence, under the leadership of women. Families wishing to live there have to abide by the rules established in the community: no sales of alcohol, and no gender-based attacks. 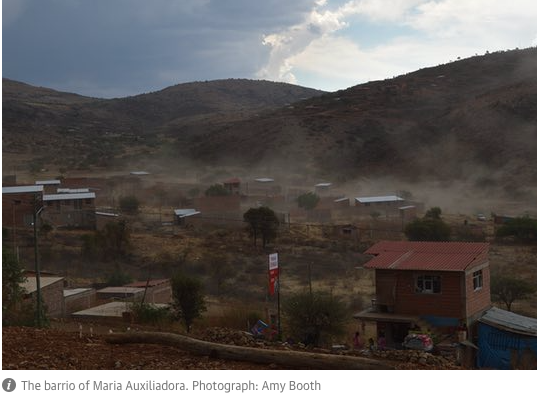 “Women tell me, ‘When we lived elsewhere he used to hit me, but with the rules here, he’s forgotten about drinking and never touched me again,’” says Rose Mary Irusta Perez, one of Maria Auxiliadora’s founders. This community is in many ways an oasis for women in a patriarchal society that has witnessed far too many acts of femicide. In the first two days of 2017, Special Force Against Violence – a police force launched in June 2013 to take care of gender-based abuses – registered two acts of femicide. According to the Bolivian attorney general’s office as quoted in Humanosphere, 94 women were killed last year, and 93 killed in 2015. 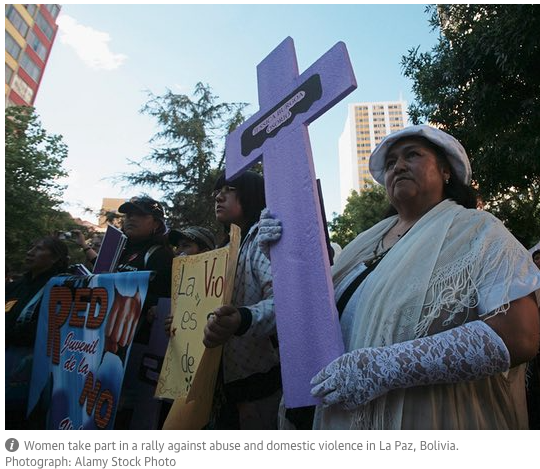 Though President Evo Morales’ administration passed a law in 2013, in order to stop intimate partner violence and penalise the abusers, with femicide punishable by 30 years in prison, only one-fifth of cases have resulted in prison sentences, according to Bolivia’s national newspaper, La Razón. For almost two decades, the people of Maria Auxiliadora have taken the issue into their own hands. The community was founded by five women, and its leadership roles, president and vice-president, are always filled by women. The founders came up with the idea of Maria Auxiliadora while working on a committee on intrafamily violence and reproductive health, as a way to help families escape the pressures of living in precarious rented accommodation with abusive landlords. The community’s land is collectively owned and cannot be sold for profit, so prices remain affordable to low-income families and guarantees them a stable home. The 420 families who live there are helped by a community-managed support committee if couples experience relationship problems. There have been open workshops educating women about different types of domestic violence, such as psychological and financial abuse. And since its inception, four men have been removed from the community because they continued to beat their families. From her grocery shop at the top of the hill, Teodocia Vallejos can see right across Cochabamba to the city’s Jesus statue. She sells flour from plastic sacks and cooking oil from a huge yellow drum – a marked change from the 16-hour shifts she used to do at a cheap restaurant. Although Maria Auxiliadora does not have formal statistics demonstrating the reduction in domestic violence, its success is widely perceived by the residents and has been recognised on an international level. The community was a finalist in the 2008 World Habitat Awards, run by Building and Social Housing Foundation in partnership with UN Habitat. The nomination explicitly recognised the project’s success in reducing domestic violence and promoting female leadership in a traditionally patriarchal culture. Resident Gumercindo Parraga Camacho has seen attitudes evolve since he first moved to Maria Auxiliadora 15 years ago. He says that at first, men in the community resented that the leaders were always women, but they have grown to accept it. He believes violence in one’s own home is taboo among men; he has never heard friends talk about beating their families. Kudos to this community and my full respect and admiration to those brave women. Bolivia needs more of this! 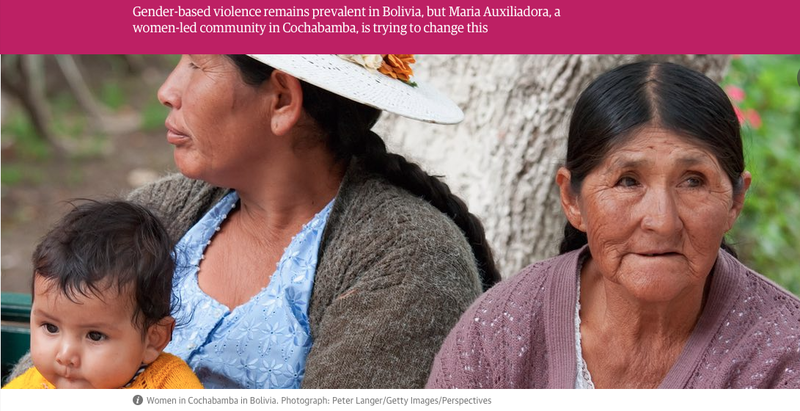 This entry was posted in Bolivia, Cochabamba, Health, Social Unrest and tagged domestic violence, women's rights. Bookmark the permalink.